Yesterday I posted a few videos of the large pair of quakes that struck Christchurch once again on Monday. Since then a few more have surfaced showing the 6.0 as it happened. Clearly even the earthquake-worn residents of Christchurch were startled by such a large temblor. This man’s home suffered some damage in the 5.5 earlier, so he set up a camera while he went about his business. Sure enough he was startled by a quake “worse than the last one”, recorded here. There’s a very nice separation between the P- and S-wave arrivals here, allowing him plenty of rumbling warning before the real lurching starts. As the shaking winds down you can still hear his stuff being jolted and see the lamp being yanked around as seismic waves continue bouncing around the jello-like sedimentary basin beneath the city. With it becoming clear that their plight may be far from over, the value of the damage from the repetitious onslaught of quakes growing by billions, the logistical nightmare of repairing/disposing of wrecked infrastructure looming, and with the threat of ever less financial protection, Christchurch residents may be understandably approaching their wits’ ends. Unfortunately this is a case where the incompatible timescales of tectonics and humanity collide. These quakes do not signal any sort of new tectonic regime nor indicate that the seismic behavior of the region has changed. They merely represent an unfortunately prolonged little geological burp–a transient period during which a little bit of strain that must be accommodated is occurring in insufficient fits every couple of months. Eventually Christchurch will quiet down, with earthquake recurrence once again far below that of plate-boundary-adjacent regions like Japan, California, Alaska, Chile, the Himalaya, Indonesia, and the west side of their own South Island, to name a few. Until then the population faces a very real hardship: more destructive earthquakes may dot the near future, and the soupy emissions from liquefaction are gradually unsettling foundations across the region. These are problems residents will have to make serious decisions about. Unfortunately human time scales can’t wait on geology to quiet down. I stumbled upon a fascinating video a couple of weeks ago showing what happens to sand volcanoes as seismic waves pass. This would have fit in either my aftershocks or my liquefaction posts from last week, but it’s both stunning and unique so I decided it deserves a post of its own. This New Zealand man is filming sand blows forming from liquefaction of a school yard in the 22 Feb M6.3 earthquake, when a large aftershock hits. Shaking from the aftershock isn’t immediately visibly apparent, but shrieks and metallic rattling herald its onset. Once the sharp noisy shaking is over, the ground continues undulating, apparent only in the fissures opened from liquefaction. As the seismic waves from the aftershock compress, dilate, and otherwise jostle the ground, the fissures feeding the sand blows open and close, alternately squirting silty water out and drawing it back down–along with the air above. Quite a phenomenal illustration of the ground’s undulation. The sight of this lends credence to some alleged eye-witness reports of the 1811-1812 Missouri earthquakes, which claim that as the ground heaved, “fissures opened and slammed shut… spewing water high into the air.” Reports like this (especially from random websites) tend to suffer from the telephone syndrome, in which subtle modifications by a series of reporters lead to misinformation. So take the accounts in that link with a grain of salt; perhaps I’ll compile legitimate resources on that fascinating earthquake sequence in a future post. One of the ubiquitous features of the nice flat sedimentary plains where people tend to prefer building cities, suburbs, or at least vast agricultural tracts, is that they generally liquefy when subjected to strong shaking. The results include serious instability of the “solid” ground, flooding, and ejection of silty water in places it would certainly be best not to have water being ejected. Imagine the layers of sand, gravel, and silt that constitute the subsurface of many cities. They’re not consolidated into hard rock yet–you can still dig through them with a tractor or even a shovel–so there is pore space between the individual grains. Water infiltrates this pore space, and tends to sink down and pool at the lowest possible position thanks to gravity. The top of this pooled groundwater is a roughly flat surface we know as the “water table.” Above it water may cling to grains and reside in the pore space, but any gaps between grains are mostly either cemented shut or filled with air. When seismic waves pass through these water-saturated layers (i.e., an earthquake happens) they compress grains and momentarily reduce pore space, increasing the pressure on the water and driving it to squeeze into new positions. As this happens repeatedly during the passage of seismic waves, the water squeezes upward and becomes more evenly distributed throughout the rock, prying grains apart and thus suspending them so that the whole batch of material begins to behave like a liquid. In a way it’s akin to mixing oil/water/milk with dry flour to make gooey batter. Sort of. When liquefaction occurs within a material that is unconfined on one side (e.g., land atop a hill or coastal bluff), it results in lateral spreading. 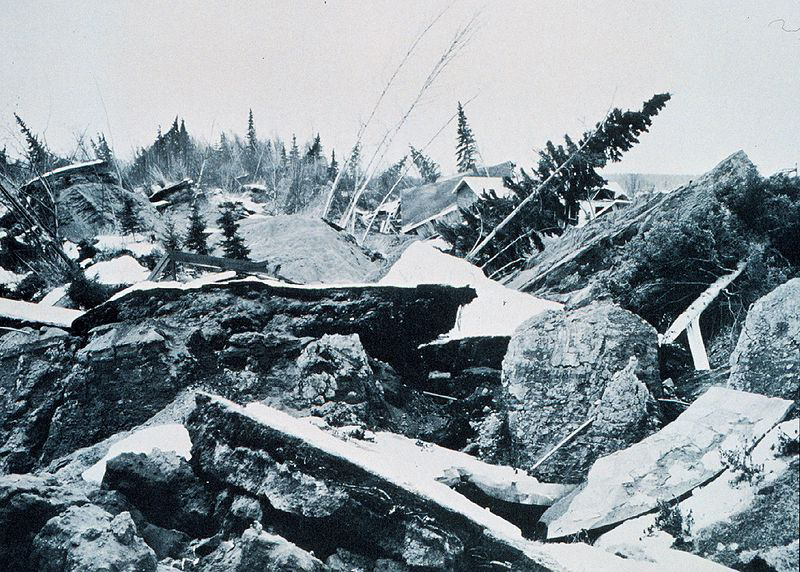 Liquefaction is common in large earthquakes, and especially prevalent in the flat-lying sedimentary basins that are ideal sites for cities and farms. If it’s inevitable, it’s at least nice to see why we’re so much at risk of it.